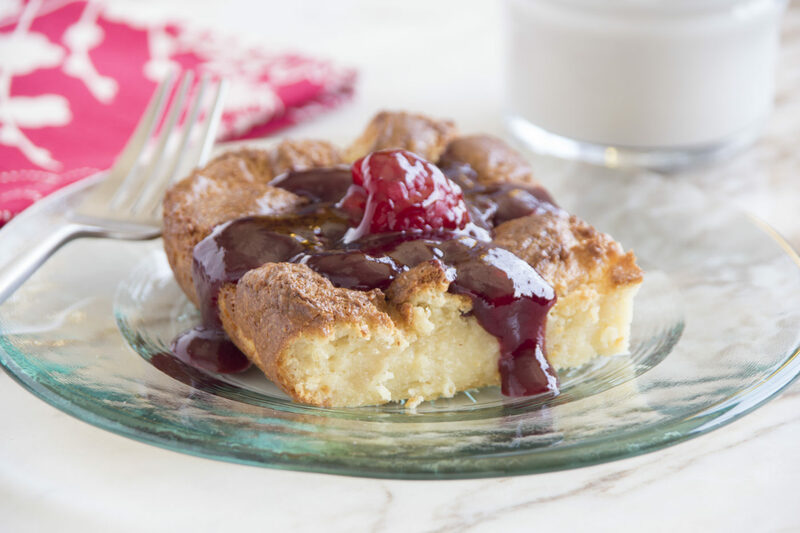 Almond flavoring gives this bread pudding a little different and delicious twist on the original. Place bread cubes in a large mixing bowl. Combine half and half, almond extract and vanilla. Pour over bread cubes, stirring gently to soak bread. Beat together eggs and sugar. Add melted chips. Fold into bread mixture. Pour into an 8-inch sprayed square pan. Bake at 350°F 50-60 minutes, or until a knife inserted in pudding comes out clean. Serve slices with raspberry sauce. Place frozen raspberries in pan to heat and add 1/2 cup sugar. Bring to a boil and add remaining dry ingredients. Cook until clear and thick. Strain to remove seeds if desired. Cool and add fresh raspberries.